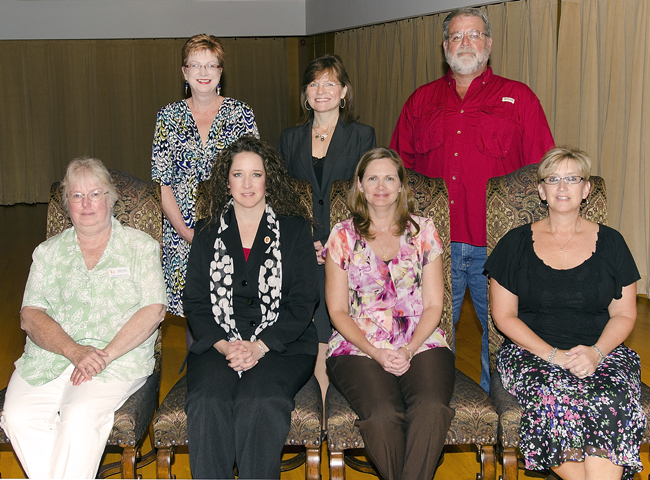 TWENTY YEAR SERVICE AWARDS — Front row, left to right: Bette Craig, Newton Gresham Library; Christie Davidson, College of Criminal Justice (CMIT); Karen Whitney, Academic Affairs; Deana Marek, College of Business Administration. 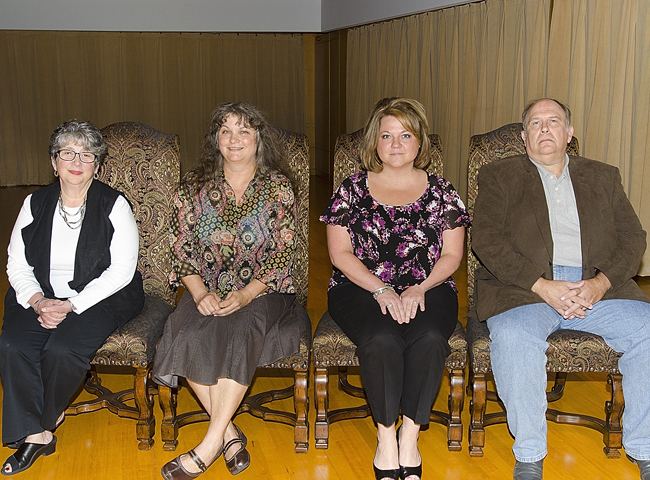 Back row, left to right: Lisa Garrett, College of Fine Arts & Mass Communication (Theatre); Cathi Gillette, Academic Affairs; and Robert Ritchie, Physical Plant. 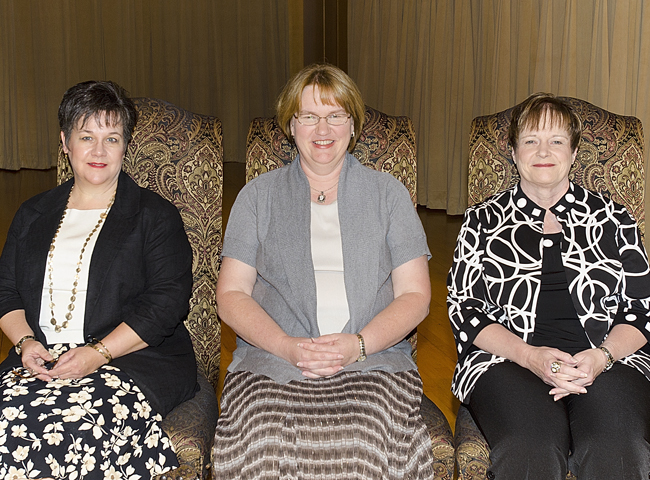 TWENTY YEAR SERVICE AWARDS — Front row, left to right: Peggy DeMers, Associate Professor of Music; Deborah Phelps, Professor of English; Toni Abshire, College of Humanities and Social Sciences; and Karen Caldwell, College of Criminal Justice. 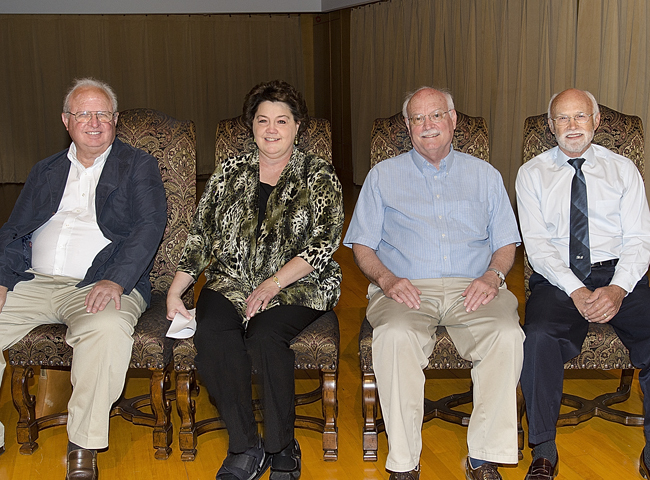 Back row, left to right: Rick Bruhn, Professor of Education; Cecil Hallum, Professor Mathematics; Hadley Leavell, Professor of Finance; and Mark Adams, Associate Vice President for Information Technology. 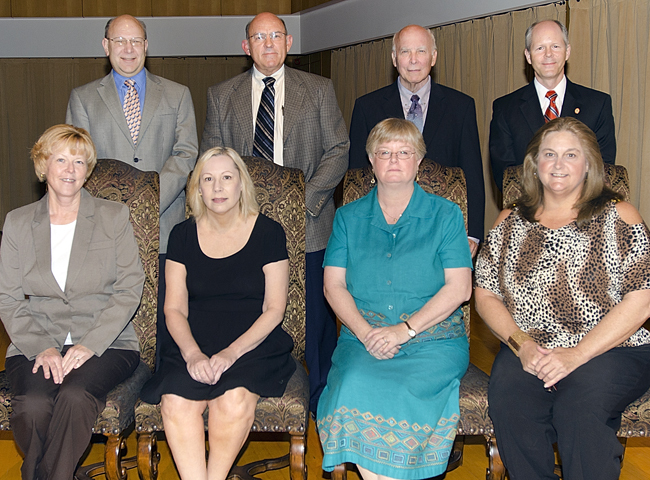 Not pictured: Cindy Gratz, Professor of Dance; Shirley Villareal, Correspondence; Isabel Rodriguez, Custodial Services; Lisa Tatom, Financial Aid; Thomas Chasteen, Professor of Chemistry; Joan Hudson, Associate Professor of Biology; Joe James, Professor of Finance; and David Kelley, Physical Plant. TWENTY-FIVE YEAR SERVICE AWARDS — Left to right: Laura Burleson, Assistant Professor of Interior Design; Sara Woods, Controller's Office; Debbie McKerall, Information Technology. THIRTY YEAR SERVICE AWARDS — Left to right: Martin Griffin, Associate Professor of Business Administration; Janice Lange, Associate Professor, Newton Gresham Library; Caroline Balke, College of Business Administration (Management & Marketing); and Kathy Hudson, Veterans Resource Center. Not pictured: Rick Carpenter, Sam Houston Press. THIRTY-FIVE YEAR AND OVER SERVICE AWARDS — Left to right: Henry Howey, Professor Music (35 years); Dorothy Roberson, Academic Affairs and Frank Fair, Professor of Philosophy, (40 years); and Max Coleman, Professor of Mathematics, (45 years). Not pictured: Harold Hurry, Assistant Professor of Business Administration (35 years). 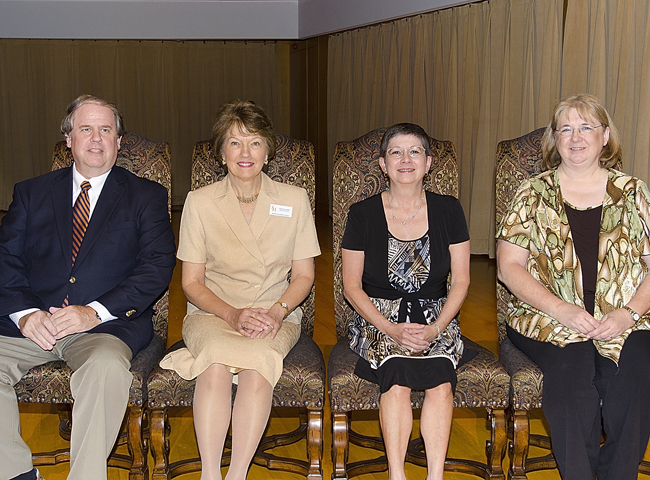 STAFF EXCELLENCE AWARD RECIPIENTS — Left to right: Bernice Strauss, SAM Center; Debbie Allen, Education Leadership and Counseling; Debbie Harper, Art; and Bill Tidwell, Procurement and Business Services. 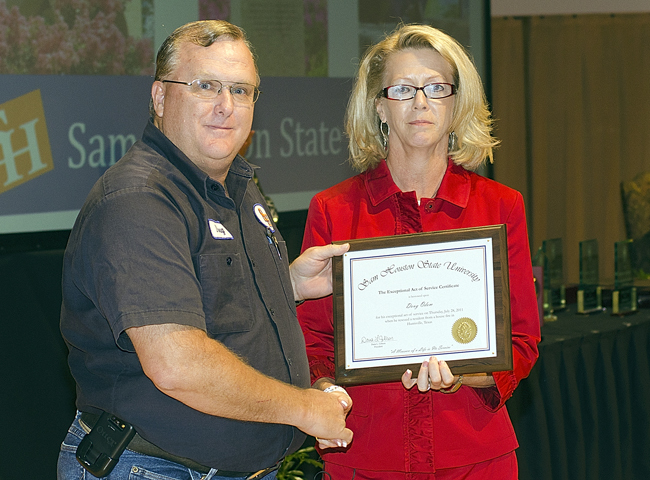 SPECIAL RECOGNITION — Fire safety specialist Doug Odom was recognized for rescuing a Huntsville citizen from a burning house this summer. 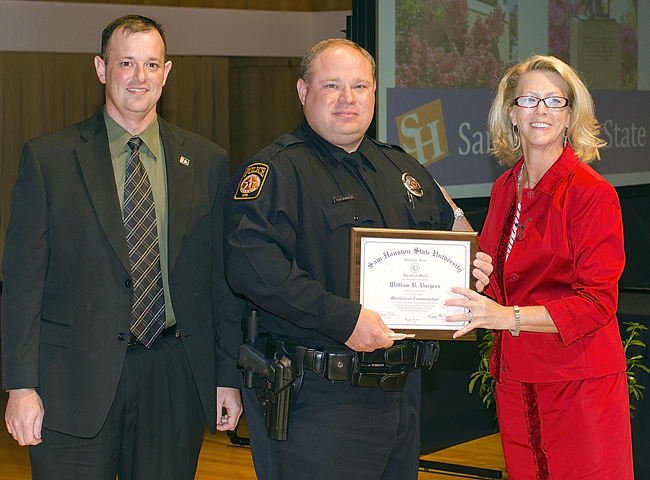 SPECIAL RECOGNITION — UPD Officer Rocky Carrell (center) was recognized for using his squad vehicle to stop a runaway SUV and preventing it from causing a catastrophe in downtown Huntsville this summer. 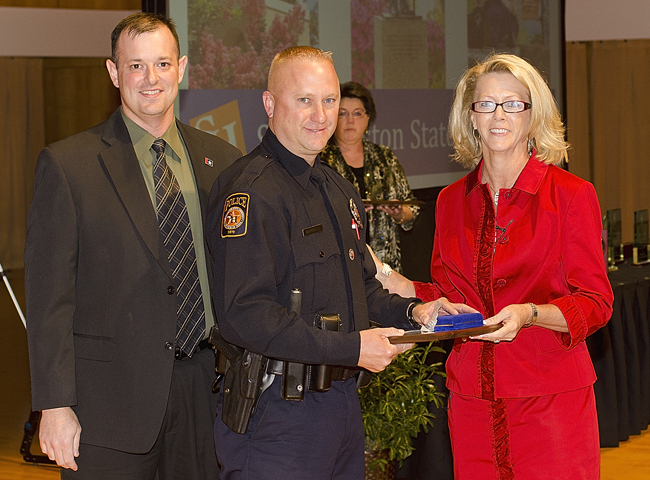 Shown with Carrell are UPD Chief Kevin Morris and President Gibson. SPECIAL RECOGNITION - UPD Officer Bill Burgess (center) was recognized for the role he played in clearing intersections when an out-of-control SUV sped into Huntsville. Shown with Burgess are UPD Chief Kevin Morris and President Gibson.